Although the NCGS monthly meetings have been suspended for the summer, Field Trip Coordinator Jean Moran has filled the summer solstice with a gem. 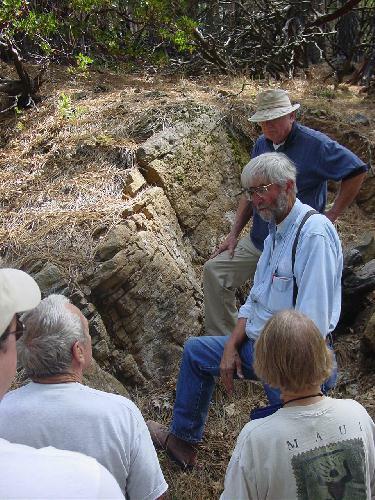 On August 2nd Sonoma State University geology professor Rolfe Erickson led about thirty geoscientists through “The Clear Lake Volcanic Field, Lake County, California.” Rolfe is an igneous petrologist who has an obvious love of these eruptive rocks. And he responded to our request with an elegant field trip guidebook and a full day among well-exposed volcanic deposits and bubbling geothermal springs of Lake County. 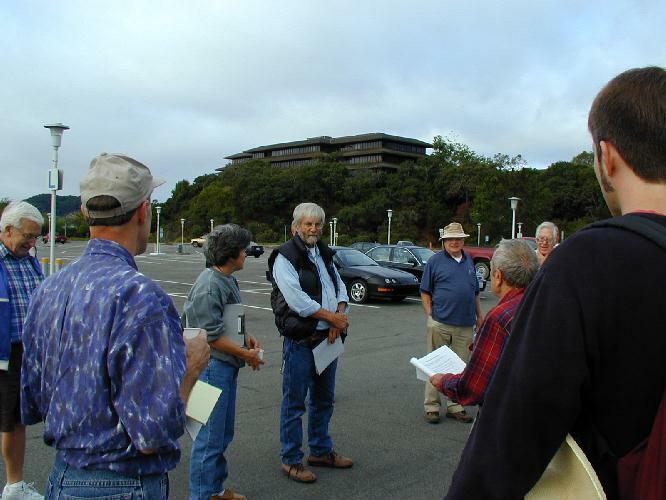 The day began with warm clear weather as the group assembled at Larkspur Ferry on the Marin peninsula and headed north on Highway 101 for Clear Lake. 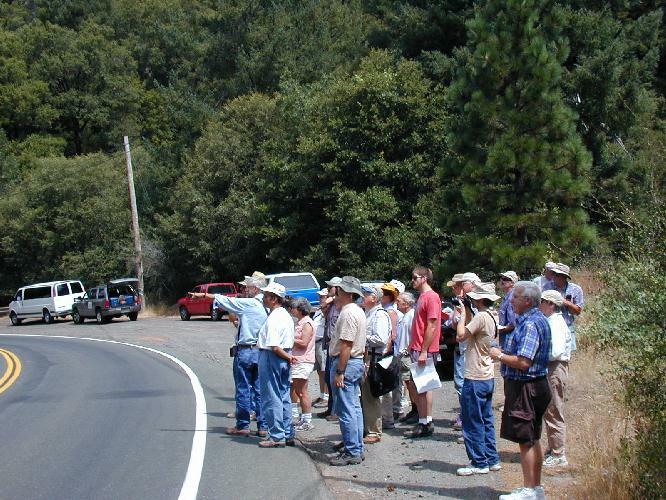 The caravan jogged eastward to Calistoga and then followed Highway 29 to the first stop about 4 miles north of Middletown and 8 miles south of Kelseyville. 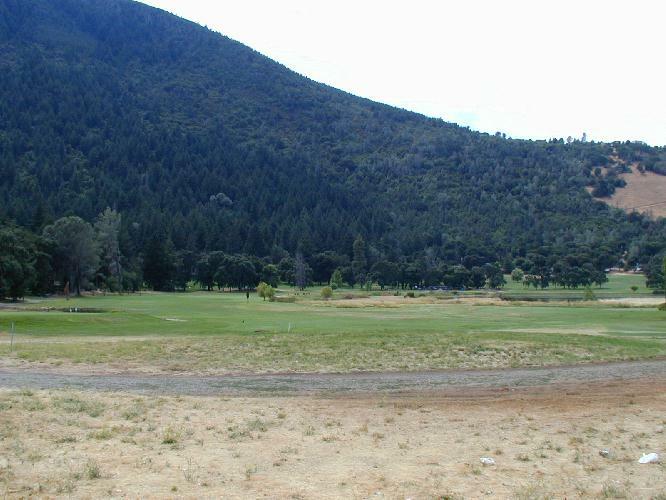 Here in an inconspicuous rural setting reminiscent of the Lake Tahoe area, Rolfe assembled the group at a small outcrop of Boggs Mountain andesite. The latter was erupted from a small shield volcano located along the Collayomi fault about 6 to 8 miles southwest of the lake. The basalt-andesite-rhyolite volcanic compositional trend it belongs to traces a continuous increase in silica and alkali content that parallels the same trend in plutonic or intrusive rock of the gabbro-granodiorite-granite series. The plutonic sequence is well documented in the intrusive rocks exposed in Yosemite National Park. 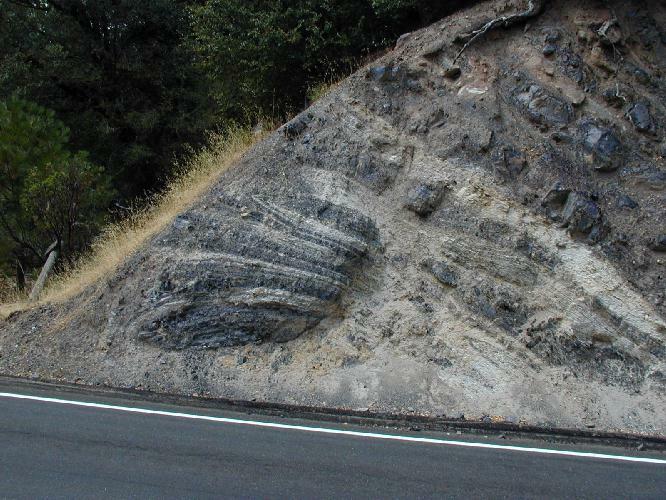 The Clear Lake volcanics are the extrusive equivalents of these deep-seated plutons. 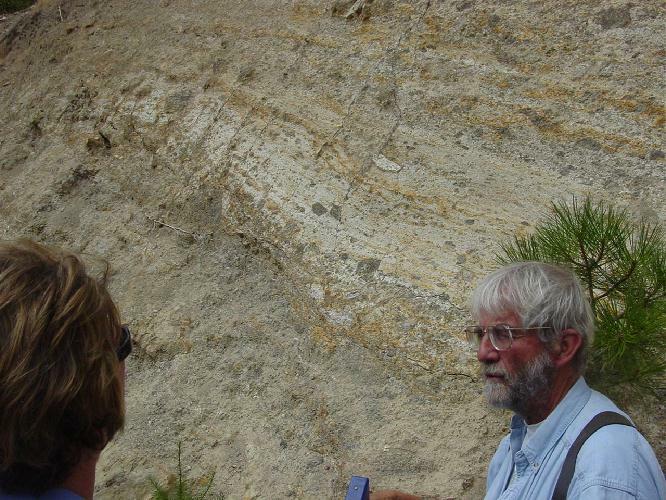 Here, Rolfe discussed the crustal assimilation model that has been invoked to describe compositional trends and microstructural features observed in the Clear Lake volcanics. 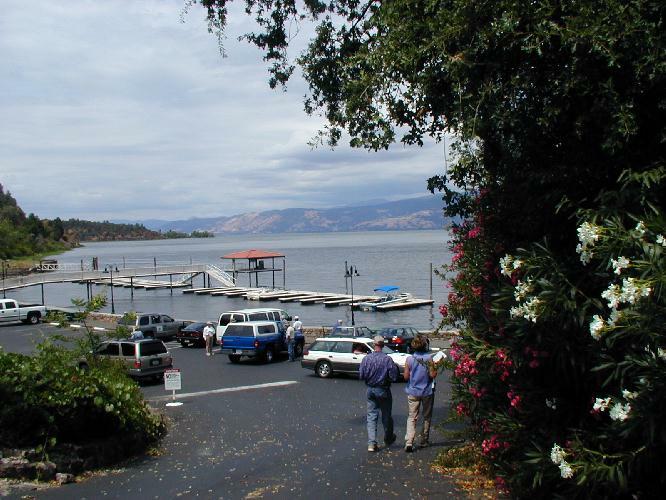 The Clear Lake volcanic field has been active for the last 2 million years. It covers an area of about 400 km2 in Lake County and has been intensively studied since the early 1970’s. It contains about 100 eruptive units and its activity can be divided into four periods: 2.1 to 1.3 m.y., 1.1 to 0.8 m.y., 0.65 to 0.30 m.y., and 0.1 to 0.01 m.y. These active periods are separated by quiescent spells of about 200,000 years. An important geochemical indicator used to support the crustal contamination model for this volcanic field is the whole rock Sr87/Sr86 isotopic ratio. Strontium-87 (Sr87) is generated by radioactive decay of rubidum-87. 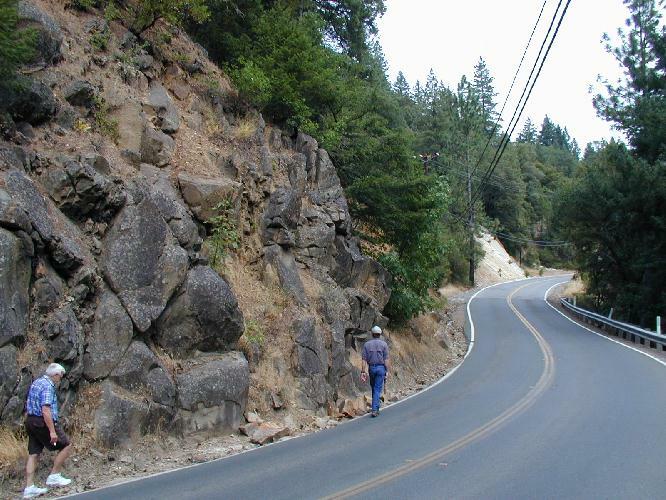 Hence, over time, a closed rock system’s Sr87/Sr86 ratio will increase. Siliceous volcanic rocks richer in Rb will also accumulate more strontium-87 over a fixed time span than more basic (basaltic) rocks. The pattern observed at Clear Lake is a primitive mantle-derived basaltic magma with a whole rock Sr87/Sr86 ratio of 0.7032 associated with andesitic and more acid volcanics with Sr87/Sr86 ratios of 0.7039 and higher. Although the difference in these two values seems very miniscule, one must remember that rubidium-87 decays very slowly, and that over a 2 million-year time span, this difference is significant. 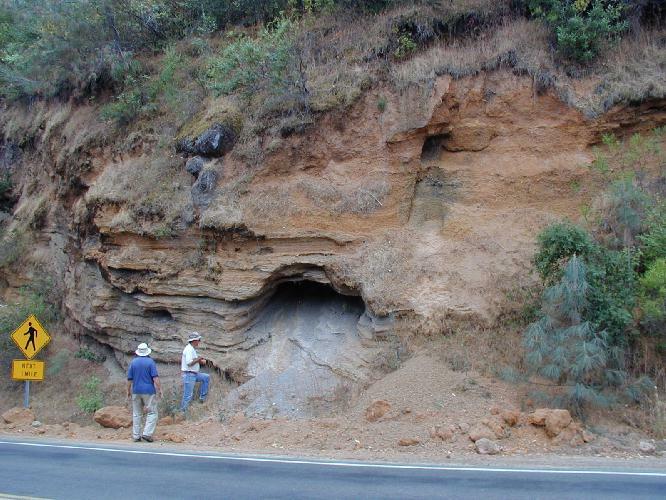 Petrologists must therefore appeal to contamination of the original basaltic magma by a source enriched in Sr87/Sr86 to explain the higher ratios of the more acidic rocks. 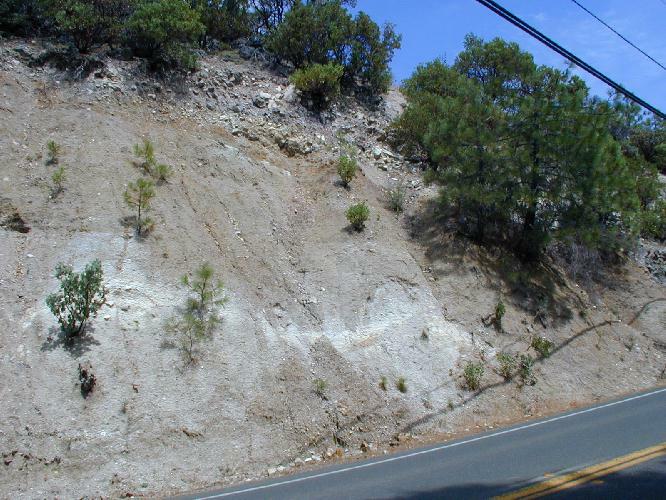 As it turns out, siliceous crustal rocks are enriched in Sr87/Sr86 and have thus been proposed as the source of the higher Sr87/Sr86 values in the Clear Lake andesites, dacites, and rhyolites. Rolfe noted that the current petrogenetic model has basaltic magmas rising to the mantle-crust boundary and residing there for a period of time while the liquid assimilates metamorphosed siliceous sedimentary material in the lower crust. 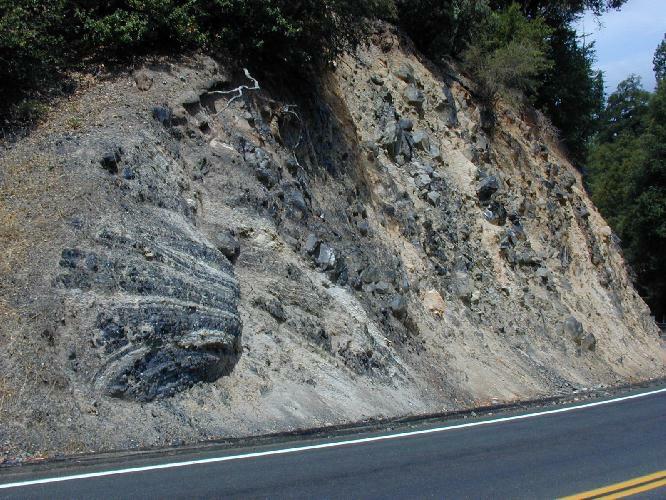 This not only boosts its Sr87/Sr86 ratio, but changes its bulk composition toward andesite and dacite. Sampling has helped confirm this model, since many of the units contain metasedimentary rock inclusions (xenoliths) and foreign crystals (xenocrysts) that are not observed in the exposed bedrock stratigraphy. The metamorphic grade of the xenoliths is also compatible with a deep-seated crustal source. The model proposed by petrologist James Stimac has a the lower crustal assimilation stage followed by upper crustal fractional crystallization in a shallow magma chamber prior to eruption. The latter helps drive the magma composition toward the more siliceous dacitic and rhyolitic end members. Stop 2 took the group to the Loch Lomond church for a look at the basal contact between the Cretaceous Great Valley sediments and the overlying siliceous volcanics. 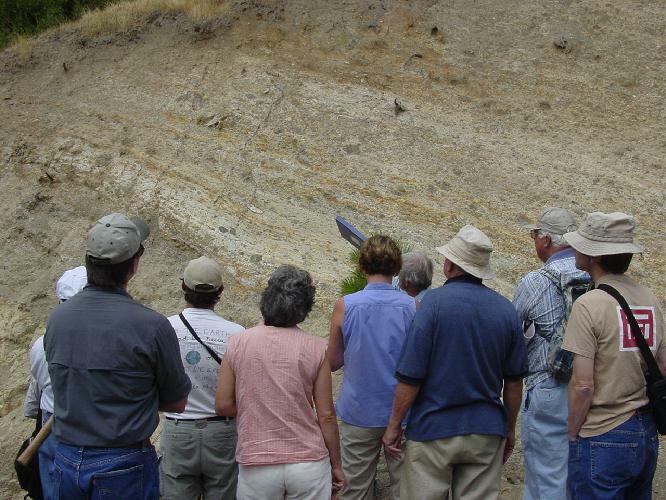 The contact is an erosional unconformity in the Great Valley bedrock overlain by bedded tuffs and some layers, possibly water-reworked, that contain blocks of Great Valley sediments. Rolfe interprets this as a vent-clearing episode early in the eruption. Subsequent vent eruption produced pumice lapilli (fragmented) tuffs and more massive units that show no evidence of reworking. This likely represents a classic Plinian eruption, belching ash high into the atmosphere in a plume that distributes fine pyroclastic dust down-wind from the vent. Looking up section across the contact between the Great Valley sequence (dark sandstones and shales in the left foreground) up to the section of eruptive tuff (lighter material in distance). The main pyroclastic unit is the Bonanza Springs rhyolite tuff (1.02 m.y.). In outcrop exposure it is capped by the 0.92 m.y. Deiner Drive rhyodacite obsidian flow. The Bonanza Springs is the thickest pyroclastic unit in the Clear Lake field. Its high Sr87/Sr86 ratio suggests considerable crustal assimilation by the parent magma and prolonged fractionation of the hybrid magma before eruption. The reworked uppermost units include an apparent lahar (volcanic mudflow) and brecciated dacite suggesting phreatic activity (hot lava in contact with water). Contact between the tuff and the Deiner Drive rhyodacite obsidian flow. 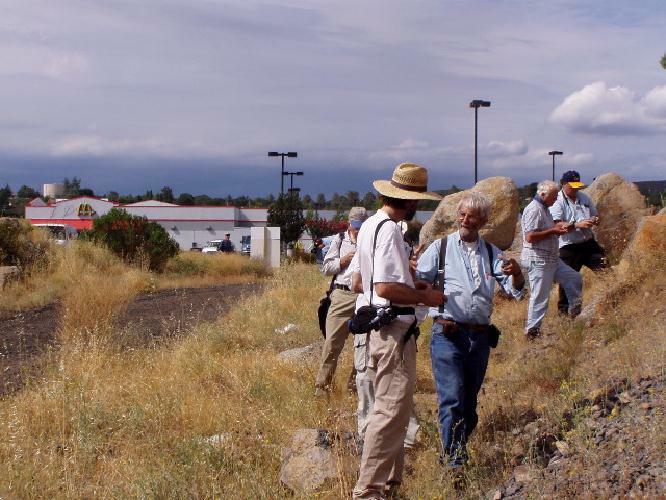 After a short drive from Loch Lomond church, the group assembled at an extensive roadcut through the rhyolite of Thurston Creek. This 650,000 year-old rhyolite is the largest flow in the Clear Lake field. It emanates from an arcuate belt 11 km. long, likely a fissure vent, and flows northward toward Clear Lake, a few kilometers to the north. 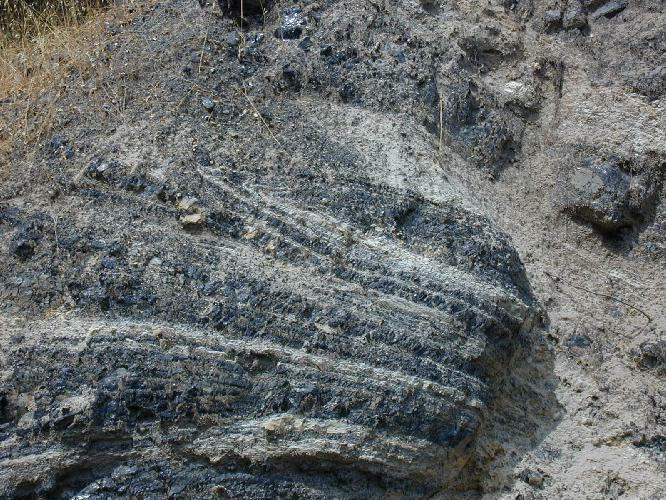 The outcrop exposes near-vertical banded obsidian interlayered with lighter pumice. To the south the layers fan out into a series of isoclinal folds, suggesting the lava mass was flowing away from the vent area under its own weight. At the northern end of the outcrop, the obsidian forms a sharp vertical contact with a devitrified felsite unit. The latter may be an intrusive contact or perhaps a sudden transition to a devitrified core surrounded by a glassy rind. To the north the rhyolite becomes more pumice-rich with blocky inclusions of obsidian glass. This is characteristic of the Thurston Creek rhyolite as one follows it further from its source. 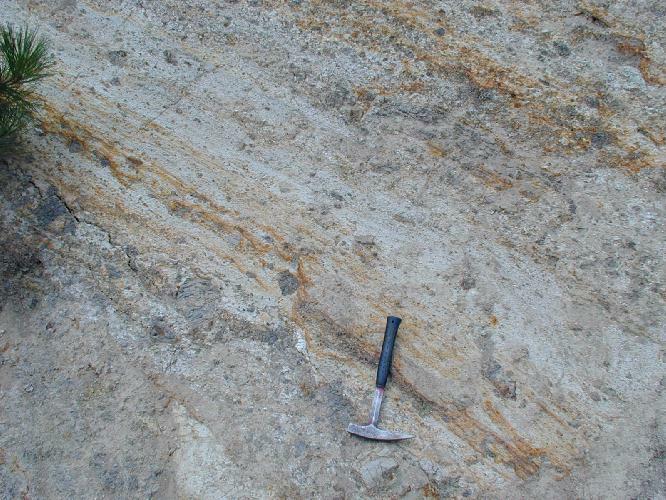 The Thurston Creek rhyolite is compositionally equivalent to the Bonanza Springs rhyolite, only it did not produce pyroclastics; its magmatic water was directed into the pumice interlayered with the obsidian. The volume of magma erupted during this event (6 km3) suggests that some of the apparent tectonic dip to the flow banded units may be the result of a caldera collapse. Isoclinal folds at the southern end of rhyolite of Thurston Creek road cut. A view from the southern end to the more massive northern end of the road cut. 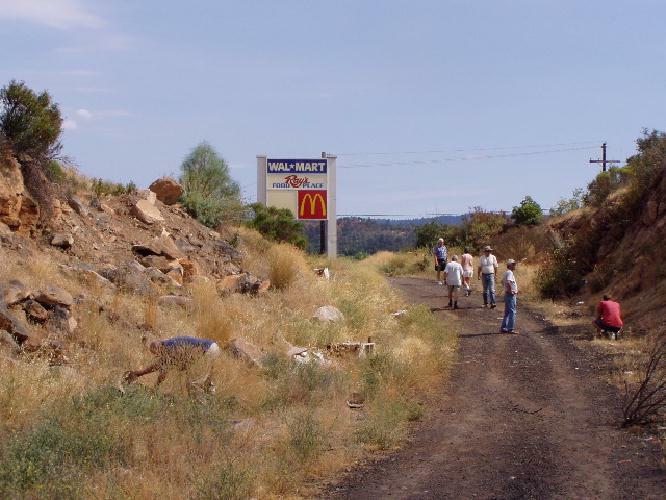 Just before lunch, the group stopped at the Maar Craters east-northeast of Kelseyville on the west-central lake shore. 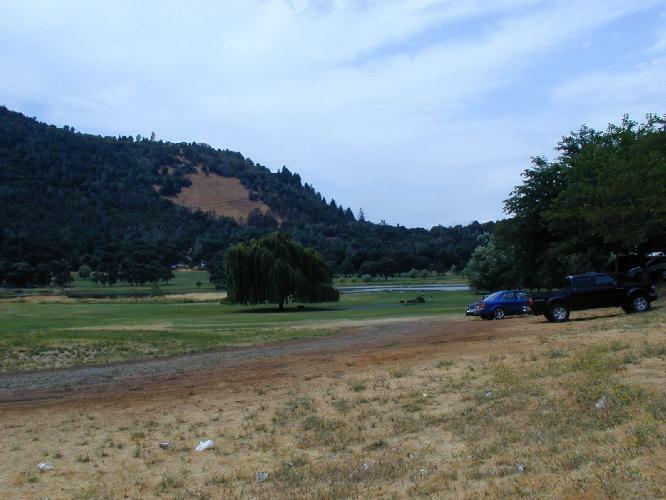 The outcrop is nestled in Soda Bay on the margin of a volcanic crater now a part of the lake. The road circumnavigating the shoreline slices through a deposit of accretionary lapilli; small, marble-sized mud and ash nodules that cling to the sides of an eruptive crater. Maar craters are formed when rising siliceous magmas intersect near-surface groundwater, triggering a phreatic or steam-driven eruption that produces a small circular crater typically less than half as deep as its diameter. 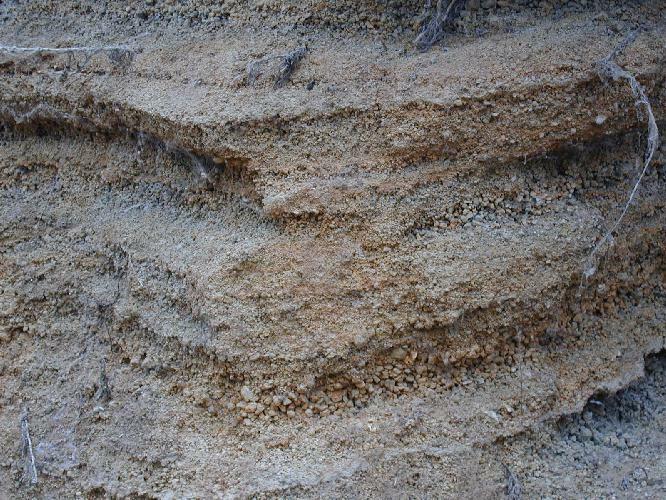 They belong to a collective class of short-range pyroclastics known as surge deposits. The three facies are: the sand wave facies nearest the vent, the plane bed facies at intermediate distances from the source, and the distal massive facies. Several of these maars form the southern end of Clear Lake. The alignment of these features suggests a fault or fissure control. The Ferndale Marina stop exposes a wonderful sequence of lapilli layers comprised of small mud nodules ejected from the muddy lake bottom. Accretionary lapilli – small, marble-sized mud and ash nodules clinging to the sides of the eruptive crater. Rolfe believes it reasonable to assume this is original bedding. The marina shoreline is arcuate in shape and reflects a series of maars eruptions. View to the north. Not far away at Little Borax Lake, the group examined a terrestrial maar now part of a local golf course! The lake sediments are rich in borax, a hydrated sodium borate mineral. From 1868 to 1873 about 140 tons of borax were removed from this site. The site was the nation’s major supplier of borax until more accessible deposits were discovered in Death Valley. On the flanks of 300,000 year-old Mt. Konocti southwest of Little Borax Lake, loomed the remains of rockfalls shed off Mt. Buckingham, one of several peaks forming the larger volcanic structure. These large dacite blocks are rubble from columnar-jointed lava that has toppled down the slope, an omen of future rockslides. Mt. Buckingham (Little Borax Lake is just to the right). Lunch on the shore at Soda Bay was followed by a jaunt to the southern tip of Clear Lake to the aggregate quarry at Round Top Mountain. 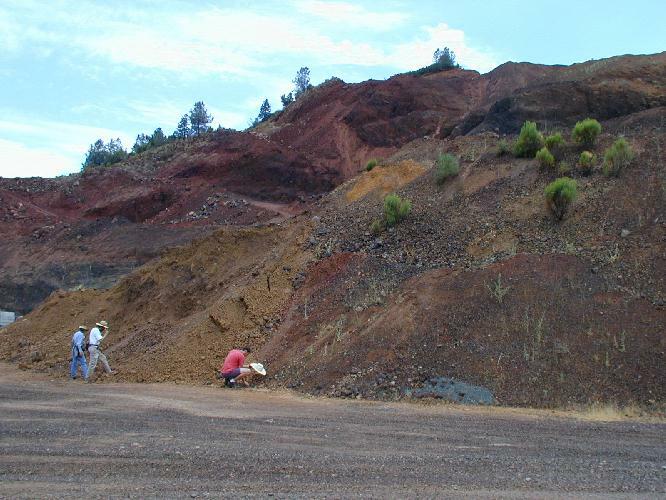 Round Top is a small, very recent basaltic andesite cinder cone dissected by the quarry operation. A small flow that escaped through the base of the cone ran eastward across the countryside and is now hidden by vineyards. Looking for xenoliths at the quarry. Three basalt flows in the volcanic field have the lowest Sr87/Sr86 ratios of all the Clear Lake lavas and are considered uncontaminated primitive magmas. The Round Top lava is an olivine-bearing basaltic andesite with a Sr87/Sr86 ratio only slightly higher than these primitive basalts. Its relatively undifferentiated character and lower crust xenolith assemblage indicate it erupted rapidly, with little time to react with the surrounding wall rocks. The xenoliths are gneisses and cordierite-bearing metapelites (metasediments) which are not part of the typical Franciscan basement assemblage. This indicates complex basement tectonics that is not reflected in surface exposures. Xenolith mineralogical relationships indicate a source at a depth of 12 to 18 km. and rapid eruption as a gas-charged magma. Round Top is the southernmost of a series of fault-controlled north-south trending cinder cones representing a mature stage of volcanic activity. Other linear cinder cone arrays attest to similar apparent fissure control of regional eruptive patterns. 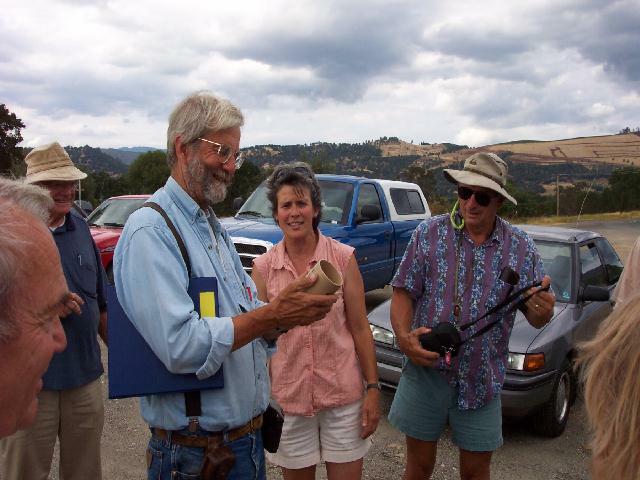 At the southern tip of Clear Lake, just south of Clearlake town, a mall excavation provides a fascinating look at the 400,000 year-old Cache Creek dacite. Microstructural and mineralogical relationships in this unit clearly illustrate that magma mixing played a major role in the genesis of the Clear Lake volcanics. Chemical and mineralogical evidence indicates the parent magma was a nearly crystallized rhyolite that was intruded by basalt or basaltic andesite in about a 50:50 ratio. The hybrid dacitic flow exhibits several telltale textural features that support this hypothesis. The dacite contains three types of plagioclase (sodium-calcium) feldspar. One is the fine-grained groundmass plagioclase. The second is a “fritted” feldspar making up almost all of the phenocryst population. It is riddled with glass-filled tubules that were formed when the magmas mixed near the surface and the more sodic component melted out. They were original components of the rhyolite. The third plagioclase is a minor phenocryst component up to 2mm in size that is not fritted. These crystals show repeated resorption and mantling with oscillatory rims zoned from calcic to sodic compositions. The latter formed in the mixed dacitic magma and reflect repeated surges of basaltic magma injected into the chamber that caused the feldspars to re-equilibrate after each pulse. The quartz in the rock also shows two generations. One is apparently an original rhyolite phenocryst or xenocryst phase now rimmed with an overgrowth of clinopyroxene. The greenish clinopyroxene also forms visible masses in handspecimen that probably represent complete reaction of quartz crystal swarms. The other generation is a clear, strongly resorbed phenocryst lacking pyroxene rims that Rolfe interprets as a late phase in the dacite magma. Sparse pyroxene-mantled olivine phenocrysts and partially resorbed clinopyroxene were likely associated with the mafic intruder, and clusters of resorbed clinopyroxene and plagioclase feldspar are interpreted as xenoliths entrained within the mafic magma. Although this dacite has not been isotopically analyzed, Rolfe feels confident that it would show rare sanidine (potassic feldspar) phenocrysts show a higher Sr87/Sr86 ratio than the whole rock value; clear geochemical evidence of magma mixing. These rocks have also been studied for the Rapikivi texture of their sanidine phenocrysts. These potash feldspars have been resorbed into ovoid shapes and then mantled with plagioclase by the injection of a hotter, more mafic magma. 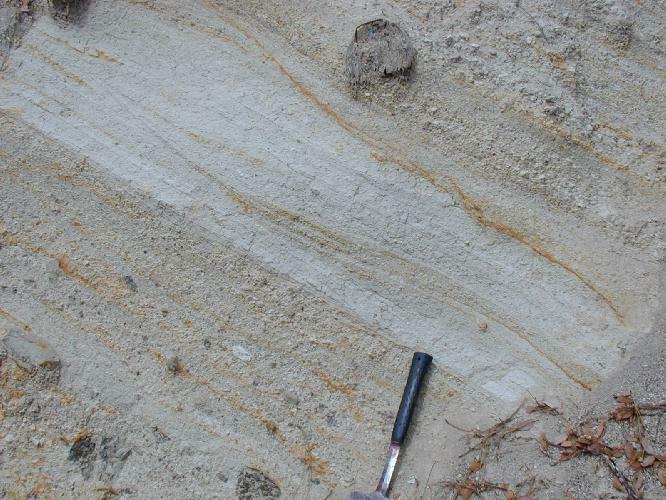 This phenomenon was originally observed in Scandinavian plutons, and its origin can be more fully understood by examining the same features under extrusive conditions. The trip headed northward along the southeastern tip of Clear Lake, passing the early (1.66 m.y. old) basaltic andesites of Schoolteacher Hill and Quackenbush Mountain. These early eruptives were mostly primitive lavas scattered to the east and southeast of the main volcanic complex. Rolfe noted that the late-stage Clear Lake cinder cones are oriented in a north-south direction and that the maars are aligned northwest to southeast. These alignments imply a structural control of regional volcanism. 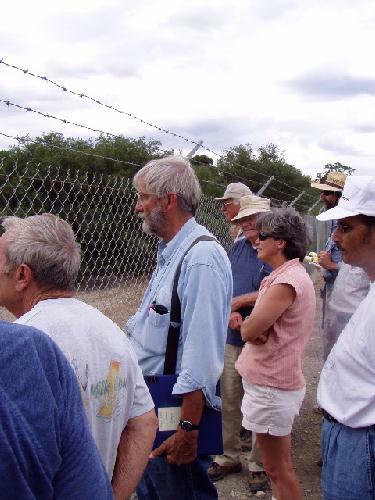 The final stop was at Sulphur Bank mine, now an EPA Superfund site. Here one can witness firsthand subvolcanic hydrothermal activity. Sulphur Bank was discovered in 1856 and subsequently mined for the next 100 years, first for its sulphur deposits and then for its mercury ore. 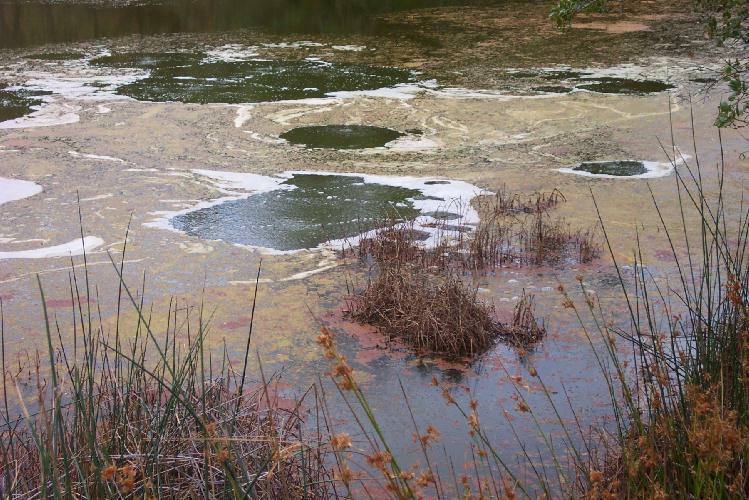 The contamination of bottom sediments in the flooded mine pit and adjacent portions of Clear Lake with soluble methyl mercury is the principle reason Sulphur Bank has become a Superfund site. Methyl mercury enters the aquatic food chain, eventually ending up in fish. This is the main risk to the public, and has compelled authorities to advise individuals not to eat more than two fish caught in Clear Lake per month, and that pregnant women abstain. The pit water level is fifteen feet higher than the lake level, and is separated by a thin septum of rock and tailings from Clear Lake. 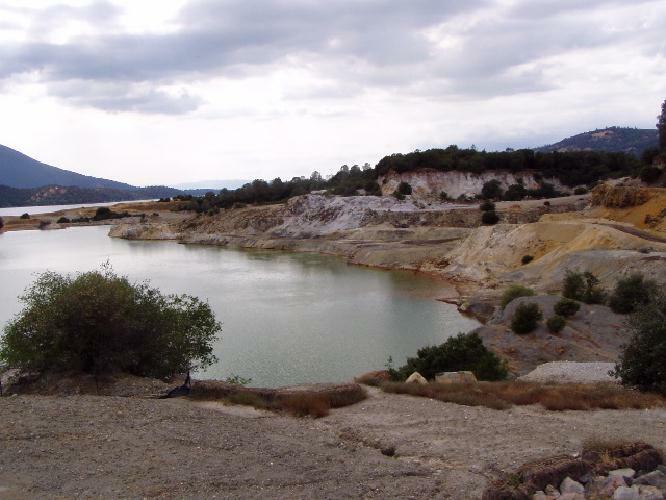 The acid mine waters have leached silica and alumina out of the andesitic volcanics, which then percolate through the thin barrier into the lake. The flocculated amorphous aluminosilicate transports the mercury, and because of its buoyancy, can be ferried around the lake by currents. 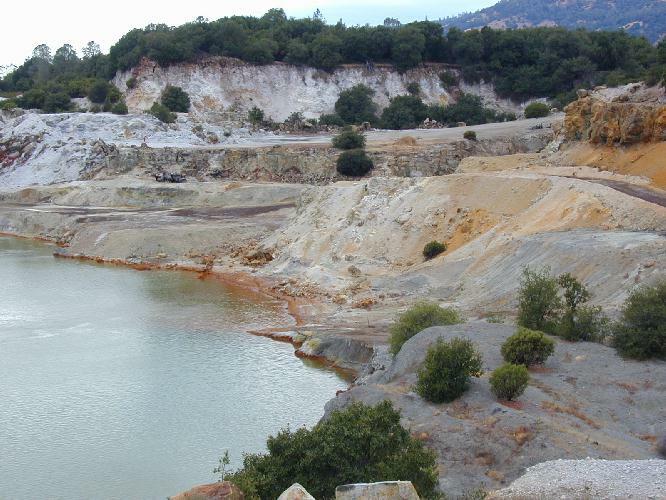 The EPA has taken measures to ensure that rainwater runoff does not enter the mine pit or the lake. The government also has plans to remediate an adjacent Indian reservation built on tailings, and to cap off existing tailing piles with an impermeable barrier. The next step is to lower the pit water level below that of the lake, but this will require an expensive permanent pump-and-treat facility. Sulphur Bank was created when a pyroxene andesite flow covered the site less than 44,000 years ago (C14 date of a log underlying the flow). This is the youngest dated unit in the Clear Lake volcanic field. The flow smothered an active hot spring system, which later began percolating through it. Hydrogen sulfide gas in the spring waters created sulfuric acid. This “solfataric” vapor eventually reduced the andesite to a residue of opaline silica and alunite. The fumarole gases precipitated elemental sulfur in fractures, and cinnabar (mercury sulfide (HgS)), metacinnabar, stibnite (antimony sulfide), and iron sulfide below the water table. The ore was initially worked by underground techniques, and later by open pit methods. 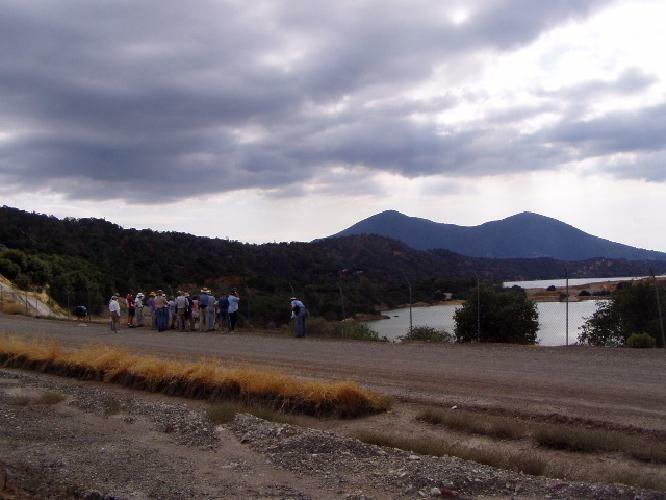 About 4500 tons of mercury were produced at Sulphur Bank, making it one of the largest mercury deposits ever worked. 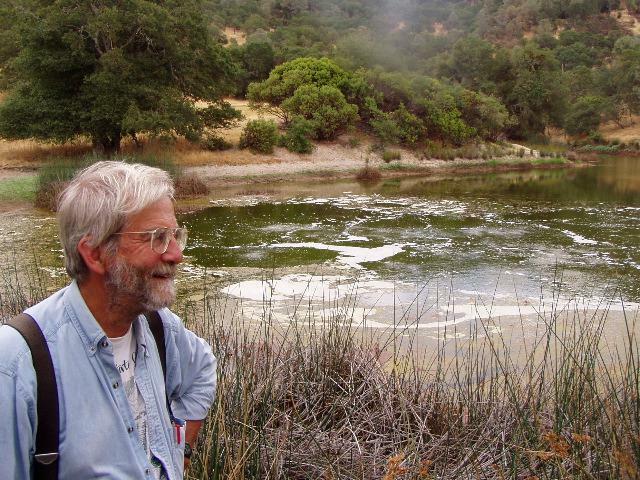 Rolfe took the group to a nearby hot spring-fed pond where sulfur and carbon dioxide gases were bubbling up to the surface. The area is obviously still hydrothermally active. Rolfe can confirm that sulfur and mercury sulfides are presently being deposited at the mine site. Various isotopic geochemical studies indicate the ore fluids are metamorphically-derived from underlying Franciscan bedrock, which is also considered the source of the sulfur and mercury. The NCGS deeply appreciates the time and effort Dr. Rolfe Erickson put into the guidebook and this wonderful field trip. Thanks are also due to Field Trip Coordinator Jean Moran and her husband Bill Martin for their usual meticulous attention to registration, food, and logistic details. Treasurer Phil Reed brought the morning refreshments and drove the rental van. Special thanks also go to NCGS Counselor and former President/Field Trip Coordinator Tridib Guha, who has quietly advised Jean and her predecessors on various aspects of our field trip program. 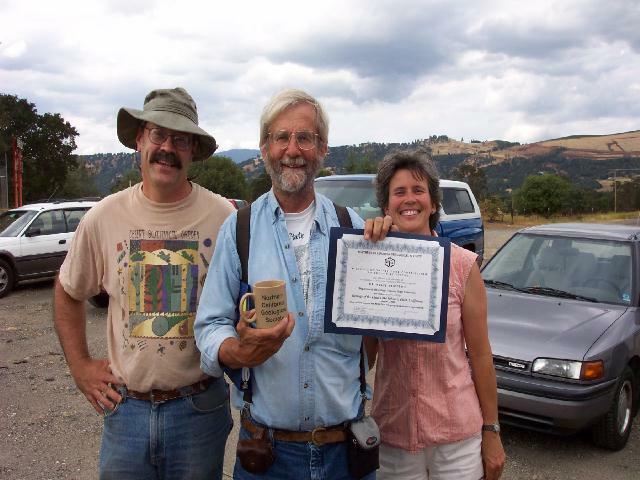 Checking out the wares – a certified NCGS mug!